The Kanektok River has a truly spectacular fishery with all five species of salmon, rainbow trout, dolly varden, arctic char, and grayling. In the month of July you have excellent opportunities of catching the king salmon of a lifetime, chum salmon that are chrome bright, leopard rainbow trout, dolly varden, and grayling. Here are some pictures from a week long trip in July where Bob caught everything he wanted and some! So you are heading south for Bonefish! You have probably been told that longer, faster and more accurate casting will be extremely beneficial to your outcome at the end of the day – this is true! As such, here is a step-by-step process to help get you started on becoming a more proficient caster. 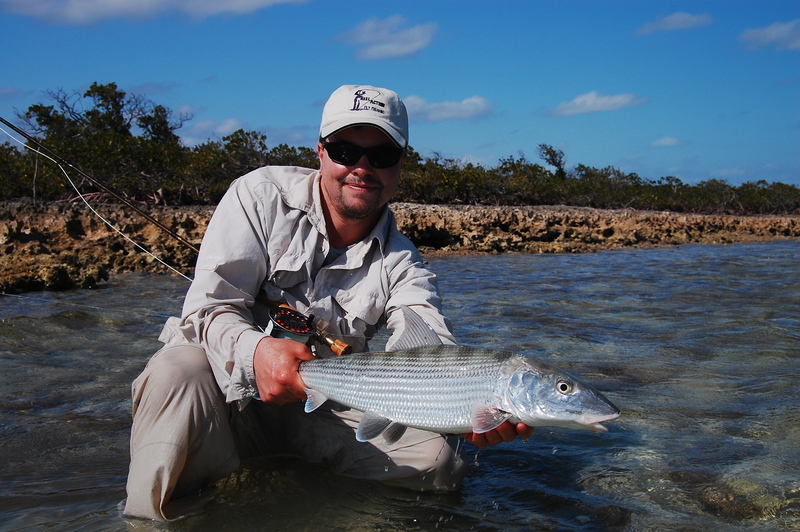 Please do not feel overwhelmed by this process – you are not only preparing for your bonefish trip, but you are making yourself a better caster for all other areas of your fly fishing career. If you want to achieve speed and distance, you will have to learn the Double Haul. To get you started with the basic mechanics, we highly recommend you pick up a good book or video on the subject. One that does a particularly good job is Mel Kriegers’ Essence of Fly Casting DVD. This can be purchased online at http://www.melkrieger.com. Another avenue we would encourage you to pursue is one-on-one instruction from an FFF Certified Fly Caster. The best way to find someone in your area, is to go to the Federation of Fly Fishers website at http://www.fedflyfishers.org and click on ‘Instructor Certification.’ Then scroll down to ‘Find a Certified Instructor.’ Here you can search by name, city or even state. Enlisting the help of a professional caster will greatly improve your casting game. There are also ‘YouTube’ videos on the Double Haul. Once you have the basics down it is time to practice, practice, practice! The Double Haul can only be learned and perfected through practice, and with practice comes muscle memory. (Muscle memory is how your brain and muscles remember a task.) Try to practice at least a couple of times a week. It could be at a park or in your backyard, but never practice for more than 20 minutes per day. After 20 minutes the tendency is to get tired and produce ‘sloppy’ casting. This is the casting that you DON’T want your brain and muscles to remember as bad casting habits will be the result. Once you are proficient at shooting line it is time to practice your accuracy. Measure out targets at 40, 50, 60 and 70 feet and have fun! After you are comfortable with your distance and accuracy, try and learn how to deliver a cast on your back cast. This will be very helpful for utilizing different wind angles. Speaking of wind, once you are comfortable with Double Haul basics, practice all you can in it. Casting in the wind is to be expected in the Bahamas, but never fear, wind can be your friend if you can cast. 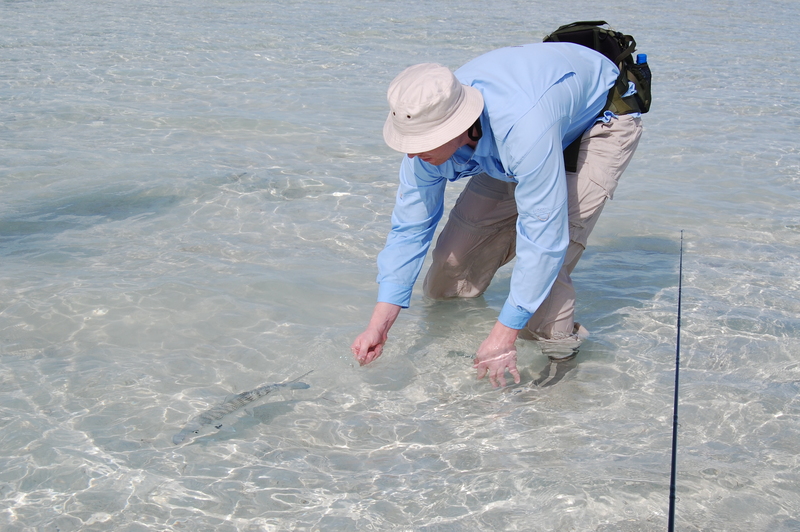 Bonefish are a lot less spooky on windy days. Practice casting into the wind and also with it coming from your left and right. This way no matter what direction the wind is coming from, you will feel comfortable and prepared. Finally, after you are at ease with your casting abilities start adding weight to your leader. First attach a small bead chain eyed fly and work your way up from there. 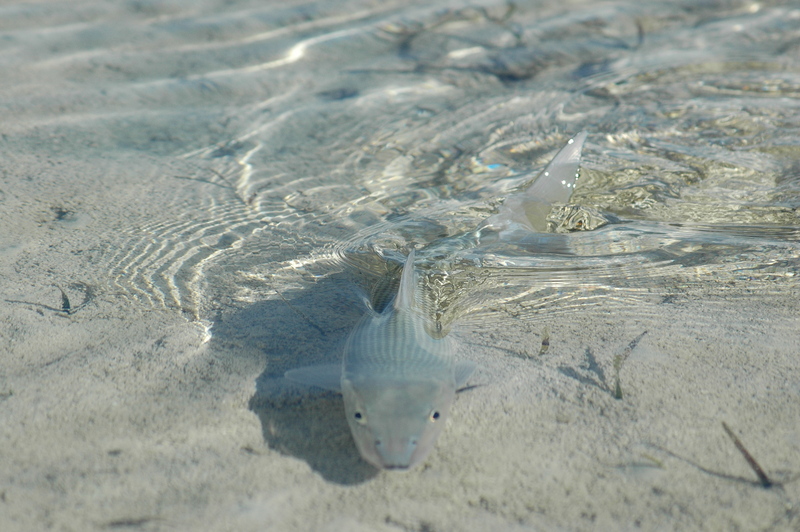 (The most common sizes used for Bonefish are small, medium and large bead chain eyes, as well as small and medium lead eyes.) Be sure you cut off the hook and also that your end leader strength is at least 10lb tippet. And always, always wear sun or safety glasses while you are casting; when you have a sharp or heavy object whizzing by your head, protecting your eyes is a good thing. Once you have added a weighted fly to your casting regime, go back through ALL the steps, practicing for distance and accuracy and in the wind. You can never be too prepared and if you live in the North East, do not procrastinate until winter to practice – casting in the snow is very cold and doesn’t work out too well!